Whichever gym you currently use, and wherever it is situated, you do not have to look far to witness common weight training mistakes. One of the most frequently observed is trainees putting too much weight on the bar. Many of these trainees attempting to gain muscle, can frequently be observed throwing weights around far in excess of what they should be using, rather than focusing on good form and optimum muscle contraction. The purpose of this article is to assist your muscle building efforts by helping you avoid some common weight training mistakes primarily related to training form. Sloppy exercise form is one of the most common weight training mistakes. Some of the reasons for this unfortunate practice will be addressed in this article, many from my own early training experience. It is an unfortunate fact for many attempting to attain a muscular physique, that relentlessly hoisting huge weight is not the most efficient method of achieving this. When I look back on my early days of weight training I realise that much of it was wasted effort. Unfortunately my ego was responsible for the majority of this non-productive time. The importance of strict exercise form when weight training cannot be overstated. The earlier in your training career that you realise this the sooner your workouts will become more productive. It took me a fair while to figure this out, and much of my very early years of training were less than optimally productive as a result. At that time, in my ignorance, the most important element of my training was how much weight was on the bar. I also lacked focus and couldn’t decide whether I wanted to be a bodybuilder or a powerlifter. In the misguided pursuit of increased strength my exercise form went completely awry. I was never content to allow my strength increases from training to progress at a natural rate. I was greedy, attempting unrealistic increases in poundages too soon and too frequently. I had much to learn and my methodology was ridiculous, especially as my strength was increasing workout by workout, as is generally the case with any beginner. However I continued putting too much weight on the bar and compromising form until my progress came to a grinding halt. Most training days my gym buddy and I would train chest, shoulders and arms in his garage. We did very little pulling work and concentrated mainly on the showy muscles (chest and biceps) like many new trainees. My back training initially consisted solely of single arm rows using ridiculous amounts of momentum to lift the inappropriately loaded overweight dumbell. I very rarely deadlifted, a hideous crime I know, and neither was I conversant with the function of my underdeveloped posterior chain. Consequently my back development was virtually non existent. Despite my bench press form – bridging excessively, and bouncing the weight off my chest (covered with the obligatory thick towels), I got pretty strong on the movement. 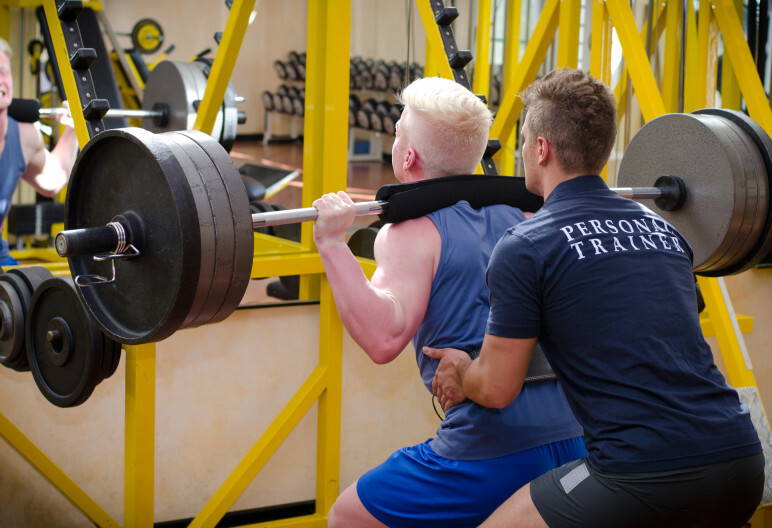 Squats however were rarely performed, as we preferred to visit the gym on leg days, to load the leg press machine with multiple plates, in order to impress onlookers. Needless to say the range of motion was severely compromised to say the least. Squats, when attempted, were never perfomed full range either, stopping well above parallel. Consequently my leg strength and development was also pitiful. I claimed the poundages for quarter squats as full ones though, if ever asked what weight I could squat (which was rare because few people in the gym did the move), and fooled myself my legs were getting bigger and stronger. I was so paranoid about the size of my legs I’d wear tight track suit bottoms under my jeans when wearing ordinary clothes, and baggy track suit bottoms in the gym. My compound moves centred primarily around pressing movements, so I was strong on these provided that I was supported by a flat or incline bench. I never did power cleans, or barbell rows, I couldn’t face them as I was so weak on the moves. I was around 17 or 18 years old at this time and bench pressing around double bodyweight. My second favourite upper body exercise was the behind neck press and I was able to perform this with poundages in excess of my bodyweight or so I told myself. However I commenced the press (with assistance) from lockout, and only lowered the bar on the eccentric portion of the lift to the top of my head. The bar didn’t travel down far before being pressed back to arms length. The limited range of motion obviously allowed me to use more weight, but at the expense of proper form and effective muscular adaptation. I became strong on pressing movements primarily because I trained them almost exclusively, although they were never done standing, probably because my spinal erectors and performance in the clean was so weak. Being so poor at some of the basic compound moves, you would logically think that I would have prioritised them, but I lacked knowledge of balanced training protocols. Additionally I was probably in denial and my ego wouldn’t allow it. Consequently my relative strength levels with regard to basic movements were totally out of kilter. My one rep maximum bench press for example was higher than my maximum squat, and nearly the same as my deadlift. Having done the majority of my work on flat or incline benches I was subsequently very weak at supporting any load overhead. To say I was imbalanced is an understatement. Of course I also didnt realise then that avoiding exercises you are bad at is never a good idea – it just compounds a problem. I was also obsessed with big arms and did lots of curls of every kind. My barbell curls were really reverse power cleans, and I also swung the weights up for incline curls which I performed after reading that they were the legendary Steve Reeves’ favourite biceps exercise. In my naivety I performed the obligatory concentration and preacher curls, to build the biceps peak as instructed by the muscle magazines. In our relentless quest to become stronger every few weeks my training buddy and I would go for a maximum lift attempt on bench press and behind neck press. Sometimes even with barbell curls, which generally just meant using even more momentum and cheating the weight up, then leaning all the way back. In hindsight we probably employed little, if any biceps recruitment on barbell curls. In fairness to my former self, I had few authoritive or knowledgeable teachers at that time, just the occasional muscle magazine so my training and programming knowledge was limited. The only really positive thing I remember about my workouts then were my enthusiasm, and the fact that they were nearly all done with free weights. Oh, and I developed fairly big and strong triceps. The reason that I recount some of my earliest training experiences is mainly to highlight the fact that a big ego and lack of knowledge is a bad combination. The ego is often the enemy in life, and likewise can be in the gym. Many of my former idiotic training habits remain common weight training mistakes. Had I known then what I know now I hope I would have left my ego at the gym door. However as I’ve said before the only real teacher is experience and the younger me would probably not have listened to advise in any case. In the commercial gym where I train occasionally, I see exactly the same common weight training mistakes that I made some four decades ago. The catalogue of abortive movements I’ve seen over the last few years is extensive and hasn’t changed much. Neither it appears have the gym wanabees who are basically the same, only their faces have changed. There are some other more recent changes however – the advent of the cell phone being one. Its now fairly common to see young men and women occupying the benches on their phone or even taking “selfies” between sets. The bench press continues as a Monday staple lift and is still often performed with four hands on the bar and a spotter performing an upright row whilst shouting “all yours”. Does this ring any bells? Squats seem to be rarely done and continue to be performed through a limited range of motion. Some seem to think that these are best performed on the smith machine. Many of these dudes turn up in groups of 4 or more wearing baggy track suit bottoms to hide the tooth picks that masquerade as legs. They then proceed to load the bar with 6 plates and perform quarter squats. Yep, I remember doing that. The leg press continues to be loaded with hundreds of kilos and worked through a six inch range of motion. Unless you throw in the towel, a point comes when you acquire enough wisdom to have a rational chat with your ego and ask yourself a question, as I did – do you want to become big and strong or just lift heavy weights? You need to realise that these are not always the same thing – there is a difference which is not frequently understood. As Mark Rippetoe is fond of saying and should be re-iterated, become a mantra even – getting stronger does not necessarily mean more weight on the bar. Additionally ask yourself – do you wish to have balanced bodily strength and development, or would you rather develop muscular imbalances, by prioritising showy muscle groups you can see in the mirror, whilst neglecting the more important ones you cant see? With all that being said and at the risk of contradicting myself, understand that as your training career progresses, you will inevitably at some point start to use some momentum in order to complete your reps as the loads increase. At this point you need to be particularly attentive. Be aware that there is a fine line between using “body english” to force the muscles to work harder, and using it incorrectly and taking stress off of the targeted muscles. Ensure that you select weights which enable the strict execution of at least 6 – 8 reps. This holds true for the majority of exercises. After the completion of these you can if you wish use “body English” to push out a few extra reps, this is entirely acceptable and can be productive as it enables work that could not otherwise be performed. Remember also that unless you are an advanced trainer you need to ensure that all your movements are performed through a full range of motion. Partials have their place as adjuncts to specialist strength training but not before building your foundational strength and correct movement patterns. Check out ExRx or You Tube if you are unsure about proper exercise form.